Now this is some serious marketing. 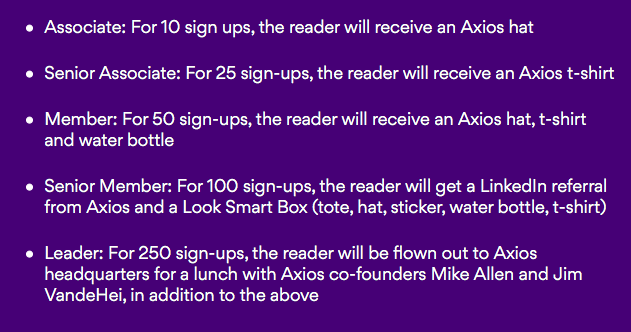 In a move to jack up readership, Axios is offering anyone who will recruit readers for the publication that means “worthy” in Greek will get a host of perks. Let’s first remember that this is the publication that recently twisted web traffic numbers earlier this month to make it look like conservative media outlets were in a grave slump. “At a time when we’re all losing trust in most of what we read and hear, there’s more need than ever for REAL, reliable news,” they write in a ploy for readers Tuesday. Setting all that b.s. aside, just what do you get for pimping for Axios? At most, you get lunch with co-founders Jim VandeHei and Mike Allen at the acclaimed Axios headquarters in EXCITING Arlington, Va. Meanwhile, there are various levels you can “climb” in the gross media socialite ecosystem of Washington. My favorite is the “senior member.” For 100 sign-ups the reader gets a — oooooh!!!! — a LinkedIn referral from Axios and a “Look Smart Box” which will make you look like a total nerd. Oh please — can I get a LinkedIn referral?! You also get a tote (horrible), an Axios hat (embarrassing), a sticker (are we 5 years old? ), a water bottle and a T-shirt. As Allen used to say in Politico Playbook, ya can’t make this stuff up.